Does purple honey actually exist? Yes, it does. Taste is pretty subjective but those who have tasted purple honey love it. But the color is not subjective – it really IS purple. Curiously, purple honey has something of a mystery about it. There are those who question it’s authenticity, but that’s simply because it is actually a little hard to come by. The reasons for this are many, but it’s fascinating to realize that purple honey cannot be produced in a way that is deterministic. It surprises even the most experienced of beekeepers, when it appears. It is also considered unique to certain states in the US, such as South and North Carolina. The characteristics of all types of honey depend on a number of factors including geographic location, weather conditions over the course of a year, types of bees and more. Even with hives positioned right next to each other – the same location, same weather conditions and so on – purple honey can appear in one hive but not the other. So what is purple honey and why does it exist? 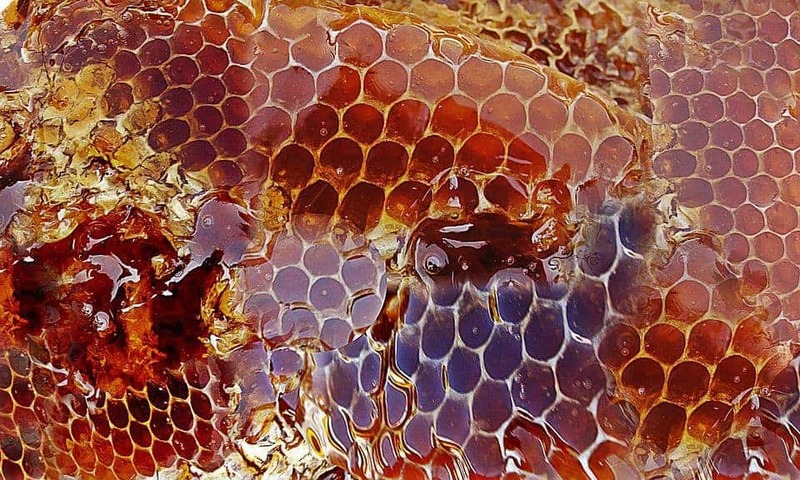 There are many theories as to how and why purple honey appears, but none are proven. One of the more intuitive suggestions that it derives from the type of flowers bees find to forage. Common suggestions include elderberries and huckleberries. But this theory becomes somewhat weak given the two-hives-next-to-each-other scenario we described above, since both colonies would have access to the same flowers in the local environment. Another idea is that it has something to do with how bees make the honey. It is technically true to say that bees in neighboring hives may produce their honey in slightly different ways. But this still seems like a strange notion, given that purple honey will appear from a hive that previously produced “regular” honey. Some have suggested that it could be related to the composition of soil in which flowers in the area grow. This theory is weakened by the same observation that only a single hive of many may produce purple honey. One of the more popular ideas is that it is a result of bees foraging from the kudzu plant. Yet again, there are apparent flaws with this argument, including the fact that in some areas the kudzu is an invasive species and, as such, is rampant in certain areas. If purple honey were the result of foraging from the kudzu plant then we would expect it to be much more easy and predictable to find. Purple honey even finds mention in a notable literary work. In the famous book “The Secret Life of Bees”, by Sue Monk Kidd, two of the main characters, Lilly and Zach, discuss how purple honey is made. It is one such theory – and also one that harks back to a day when even the most rare of honey was a lot less expensive than it is today! And so purple honey does indeed remain something is a mystery. When beekeepers happen to locate purple honey in their hives there is generally a good deal of excitement. Apart from the knowledge that purple honey is renowned for having a wonderful taste, some beekeepers will take the opportunity to sell – at very significant premium, given it’s rarity. If you are looking for purple honey for sale, we are going to wish you good luck! It’s not easy to find and, when it is available, it tends to command a hefty price. But if you happen to know of a source, however temporary, we’d love to learn more (just comment on this page). So, purple honey isn’t easy to find – but we’re told it tastes fantastic!